Our pre-wired LEDs are nothing but quality. Pico has become a tradename for this particular pre-wired led size. The 12v 0402 'Pico' SMD pre-wired wide angle red led puts out a nice color that is sure the illuminate your product or project. Our 12v 0402 'Pico' SMD red wide angle pre-wired leds have built in resistors so that they will work with the voltage that they are rated for. There is no need for you to add any additional resistors. The only thing you need to do is add power / ground and they will illuminate. It doesn't get much easier than that. The 12v red 0402 'Pico' SMD pre-wired leds come with a built in resistor, all connections are heat shrinked in order to protect them and there is sufficient wire lead on all of them. This single setup works well with the following voltages (you don't have to select a voltage when ordering): 9, 10v, 11v, 12v, 13v, 14v, 15v, 16v, 17v, and 18v. While we advertise 9v as the lowest they will work with, they still typically work well at lower voltages. If you want to optimize the light output for any specific voltage and you know what resistor you want then it is very easy to change the resistor because we have added it on to the end in this particular 0402 pico pre-wired led design. We have done it this way because the LED is obviously meant to be used in small or confined spaces and we don't want the resistor to get in the way. You can also ask us for suggestions on resistor selection for lower voltages or refer to our resistor charts on the specific LED product pages that will help with the optimal resistor to use with lower voltages. These are provided in packs of 5. 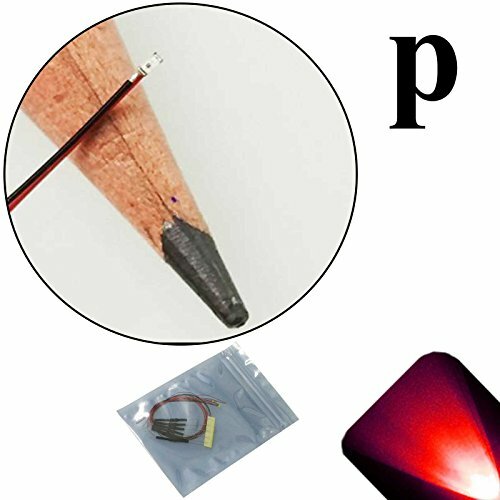 We typically do not believe in selling in preset packs, but in the case of the pre-wired Pico LEDs it is best for us to package them this way for handling and ultimately it protects them during shipment. If you have any questions about this product by Lighthouse LEDs, contact us by completing and submitting the form below. If you are looking for a specif part number, please include it with your message.